Please refer to our stock # TBD00233 when inquiring. A molded edge porcelain dessert serving dish, Spode circa 1814 with bat transferred fruit in the center. Pattern number 1686 hand painted on the bottom. Unmarked, but the distinctive border of twined dolphins alternating with a large plant (?) is a Spode design. 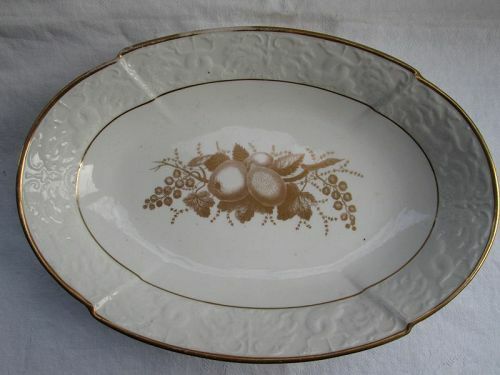 The pattern of fruits is currently made by Spode and called “Chatham.” The border is set off with a band of gilding at the rim and the inside edge. The bat transfer is an unusual color, almost brown at some angles and gold at others. The dish is 10 ½ long by 7 ¼ wide by 1 7/8 inches tall. Condition; No chips, cracks, hairlines or repairs. Gilding loss on the edge on one side where it was either passed with the right hand or held out by a servant.